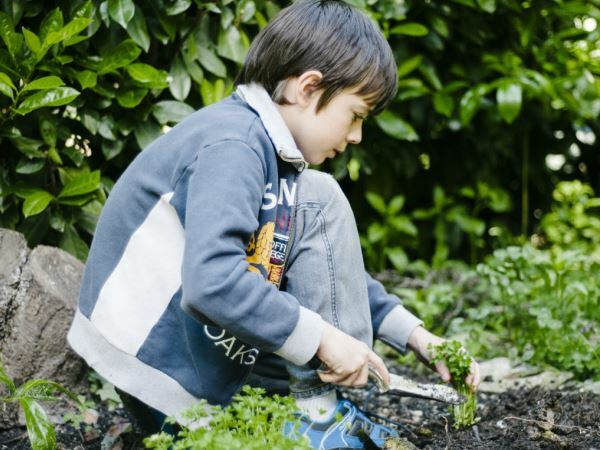 Teaching children to garden is a great way to help them stay healthy, researchers claim. Academics have studied the impact of the Shaping Healthy Choices Program (SHCP), which was implemented in four schools in two California districts, with 179 fourth grade students, aged from nine-10, years, serving as controls and 230 as part of the intervention group. During the one-year programme, students engaged in classroom nutrition education enhanced by gardens established at the schools, harvested vegetables for cooking demonstrations and shared the produce with their families. In addition, newsletters relating to health lessons were sent to parents, health fairs were held at schools and salad bars were installed. Accordingly, the researchers found that those children involved the SHCP demonstrated significant improvements in nutrition knowledge and vegetable identification compared to control students. And while vegetable preference and fruit and vegetable intake did not improve, significant changes were observed when it came to body measurements. "The Body Mass Index (BMI) and waist-to-height ratio were greatly improved in intervention groups, with the overweight or obese population declining from 55.6 per cent to 37.8 per cent at the Northern California intervention school," said lead author Dr Rachel Scherr. "The dramatic decrease in BMI, although unexpected in this short time frame, demonstrated that the SHCP was effective due to positive health messages and reinforcing nutrition concepts throughout the school and home environments." Researchers believe that by focusing on message reinforcement and connections to the community, they were able to achieve significant improvements in health-related outcomes. Dr Scherr added that the encouraging results suggest such programmes may positively impact childhood obesity rates.